Dogethereum project served as a powerful upside trigger. DOGE/USD gained over 25% in recent 7 days and doubled in value since mid-August. Dogecoin (DOGE) is a joke coin created in the end of 2013 and called in the name of a popular internet meme Doge. Dogecoin was sitting quietly for a prolonged period; however, everything changed in the end of August, when the project revealed the plans to launch Dogethereum project that will allow tokens exchange between Dogecoin and Ethereum platforms. The project went live on September 5 and served as a strong growth driver. Remarkably, the cryptocurrency has been growing even amid the global decline on the cryptocurrency markets. On Sptember 8, Dogecoin beat Zchas and Dash by market value. Currently, Dogecoin takes 19th place with the market cap nearly $800M and average daily trading volume $71M. DOGE/USD is changing hands at $0.0065 at the time of writing against $0.0033 on August 15. 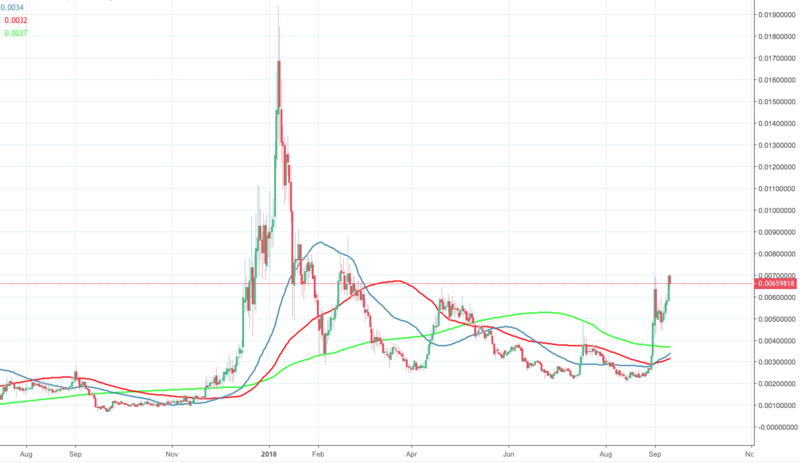 DOGE/BTC upside trend is even more impressive as the coin has nearly tripled in value against the digital currency No. 1. “Dogecoin may have started as a joke, but their community is now the envy of the crypto world,” Kevin Rooke, a Canadian cryptocurrency researcher, wrote in his Twitter account. These words are probably the most interesting reflection of what’s going on the cryptocurrency market. Since its inception the joke cryptocurrency has become a popular coin for micro-transactions, tipping, and gifting. Thanks to an ever-growing community, there are millions of dollars flowing through the Dogecoin network on a daily basis.